Finally a classy drink made with Goldschlager. 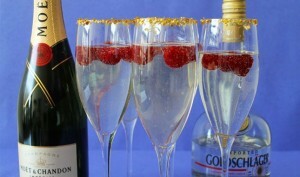 Rim a flute glass with syrup and dip into edible gold. Add raspberries. 2 oz. of Goldschlager and top with bubbly.